Lately I covered a lot of topics surrounding the new DJI Mavic Air (Mavic Air Fly More Combo vs Mavic Pro Platinum Comparison). While doing so i noticed there are a lot of unanswered questions regarding the New Mavic Air Filter System. In this Review I’ll explain how to mount your newly acquired Filters properly. First of all I want to thank the guys from Polar Pro. They made this Tutorial possible by setting me up with their new Cinema Series Vivid Filter Pack for the Mavic Air. Let’s beginn by taking a look at what has changed. Even though the DJI Mavic Pro, Mavic Pro Platinum and Mavic Air are sharing the same Sensor, there is a huge difference between the Mavic Pro and Mavic Air Series. With the Mavic Pro we had a push on system. You just had to take your lens out of the box and push it onto the Camera of your designated Drone. This introduced especially in the beginnig certain issues. The Manufacturers had to minimise the weight and size of the Filters. If they failed at either, you ended up with a Gimbal Overload or you had to put on the Filter after the Startup Sequence of the Gimbal. Meaning you had to remove the Filter every time you fired up your Drone. DJI created in the beginning their own Filters. Unfortunately they were so delicate, that they sometimes broke the first time they were used. Fortunately for us users they decided to partner up with Polar Pro. You may ask what is the difference between a PolarPro Filter and why shouldn’t you get a cheaper one. That’s actually pretty easy. Glass comes in different qualities, so Glass isn’t just Glass. PolarPro is using high quality Glass for their Filters. Every Cinema Series Filter receives an additional anti glare and reflection coating. This point in my opinion is the most important aspect of the PolarPro Filters. I often end up capturing footage under harsh conditions. Whether it’s a frozen lake at -10°C in bright daylight or in the middle of an ocean at +35°C. I never ever had any unwanted reflections or any kind of glare. But enough about the build quality of the Mavic Air Filters. If you don’t know what you need Filters for, what the difference between an ND or PL Filter is, make sure to check out my thorough Tutorial on how to choose the right Filter and which Settings you need to use. The Moment you have a Mavic Air in your hands you’ll notice that the gimbal got a serious upgrade compared to the Mavic Pro Series. To get rid of the Problems I mentioned above, DJI implemented a new threaded Filter System in the front of the Camera. This system will make sure your filter is mounted properly and you easily can store your Drone with the Gimbal Lock attached. But where there’s light there is also darkness. The new Form Factor of the DJI Mavic Air led to a more rigid gimbal, but way smaller filters. I’m almost certain, pilots with big hands will struggle with the new Mavic Air Filter from time to time. In order to be able to mount your filter, you first need to detach the cover on the front of your camera. If you look close enough you’ll notice there is a little ring. This ring can be unscrewed counterclockwise. Don’t be afraid the first time you detach it. It sometimes sits very tight and you’ll need some force to loosen it. Using a rubber glove can help removing the Mavic Air Filter for the first time. Once you detached it, you’ll notice there is no Filter or Glass in it. So it’s just a plain threaded cover with a hole in it. The Filters in my example are made out of two individual parts, that are mounted together. Number one being the threaded Mount Ring. Number two is the twistable Filter Carrier. The easiest way to mount the Filter is, to grab the Gimbal on the side with one Hand. While you grab the Filter with the other. Now you screw the filter on clockwise. While doing so make sure to grab the ring in the back and not the one in the front. To avoid any damage to your camera, don’t use any force at all. The moment you align the Filter properly it’ll be in it’s place within of a few turns. Now let’s take a look at the ring in the front. This can be used to adjust the intensity of the polarising effect on the PL Filters. 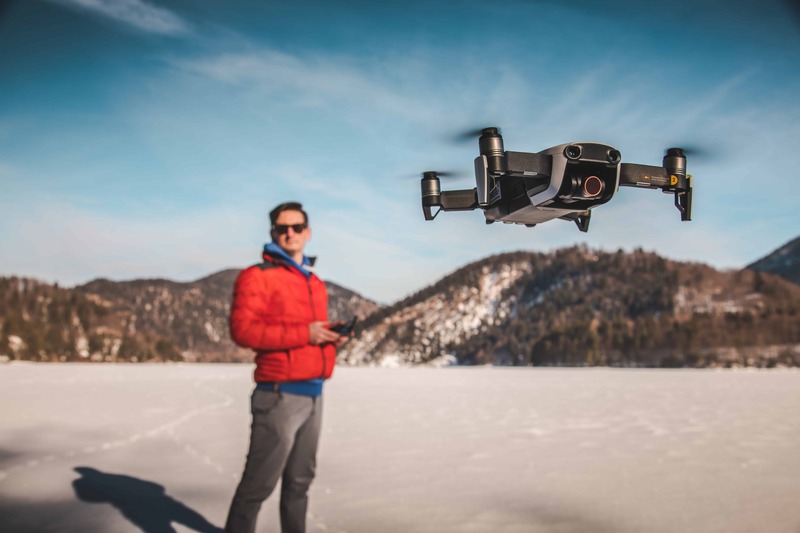 The highest effect with PolarPro Filters is achieved when the PolarPro Logo is facing towards the bottom of the Drone. The beauty of the new Filters is, you don’t need to take of your filter in order to adjust the intensity of your PL Filter. At the same time your Filter is secured tightly with the threaded ring in the back. In my opinion this is a huge improvement compared to the old Filter System. This should answer most of your questions regarding the DJI Mavic Air Filters. If you still have questions, hit me up in the comments. If you liked this Tutorial and you’d like to support me in my future projects, I encourage you to check out these Amazon affiliate links to the Products I reviewed today. Previous: Previous post: Mavic Air vs Mavic Pro Comparison – Which is the right one for you?